Response to intervention is at the heart of evidence-based practice in schools. Though written into federal special education legislation, it is a general education process consisting of a three-tiered framework for organizing a comprehensive and differentiated system designed to ensure educational success for all students. The focus in this book is on meeting the social, emotional, and behavioral needs of students. School social workers are key stakeholders who need to be skilled in designing, monitoring, and evaluating the effectiveness of school-wide universal supports, targeted group interventions, and intensive individual interventions in objective and measurable terms. Designed as both a training manual and a practical reference, with contributions by seasoned academics and practitioners with extensive experience developing and practicing in response to intervention systems, this one-of-a-kind guide operationalizes this crucial service delivery framework. It highlights the importance of data-based decision making and offers concrete guidelines for collecting, analyzing, and displaying data. 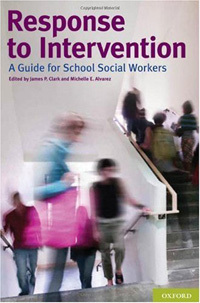 Detailed case examples that illustrate real-world program implementation, practical guidance in selecting empirically supported practices, sample assessment worksheets, and strategies for supporting the adoption and sustainability of response to intervention systems make this a handy tool for school social workers seeking a more active role in using decision-making processes to improve their school's system of support for all students.